If you’re a woman and looking for your first shot wandering around the winter wonderland with snowshoes, below you’ll find a few best snowshoes made specifically for women. Snowshoeing has been increasingly popular for the last few years. It’s not hard to see why. This winter sport has relatively zero learning curve and everyone, regardless the gender, can do it. Whether you’re up for long long trekking and blaze your way through varying winter terrains or just attempt to stay fit in the winter by jogging on the groomed trails, you can do it all with a pair of good snowshoes. Now before we go further to the details of each of the snowshoes listed above, you should know that snowshoes are available in men’s, women’s and unisex models. However, the only distinguishing features between the three of them, most of the time, are the sizing and the binding. In fact, men’s specific snowshoes and the unisex models are often different in colors only. Women’s snowshoes are generally made smaller in size with the tails tapering at the close. It is done as to accommodate women’s shorter gait. With smaller snowshoes, it is expected that they’d be more agile and efficient with each step they make. Furthermore, since women’s feet are commonly smaller than men’s, the bindings are also designed to fit smaller boots. That said, you will significantly benefit from women’s specific snowshoes if you’re a petite woman. Other than that, you’ll do just fine with those of unisex or men’s models. As a matter of fact, it may come to your surprise that many women are comfortable with men’s snowshoes. 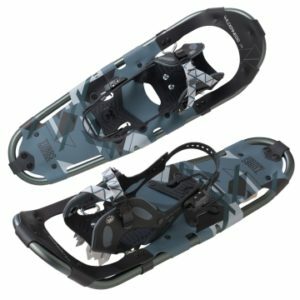 MSR Lightning Ascent is possibly the most advanced backcountry snowshoes you can find in the market today. From a lightweight yet durable aluminum-nylon combo construction to the most aggressive traction systems running 360-degree around the outer frame, these snowshoes have everything you need to tackle some really challenging steep terrains. The comprehensive technical specifications of MSR Lightning Ascent are obviously an overkill for recreational snowshoeing. However, if you hope to find backcountry snowshoes that work great for various snow conditions, nothing is better than MSR Lightning Ascent. MSR Lightning Ascent comes in both men’s and women’s specific models with three size selections: 22-inch, 25-inch, 30-inch. You will have to consider the total weight load, which is your own body weight and whatever it is you carry, to determine the ideal size for you. The largest size can guarantee satisfactory flotation over deep snow for maximum weight of 300 pounds. Should your weight load exceeds that number, consider using the 5-inch add-on flotation tails. The Wilderness is the mid-range snowshoes manufactured by Tubbs. Like other snowshoes from Tubbs, they come in both men’s and women’s version with the latter looking prettier, thanks to the brighter splash of colors. The aluminum frames coupled with Soft Tec decking are a tad heavier for typical recreational snowshoes. However, they do offer unmatched stability. You can feel it more clearly as you travel with loaded pack on your back. That’s why these snowshoes are popular among winter hikers and backpackers. As far as the flotation is concerned, Tubbs Wilderness perform quite well on soft fresh snow but they fall short on deep powder. That should be expected, though, since they’re not full-blown backcountry snowshoes. The semi-aggressive crampons underneath the decking pack quite some bites in them. Combined with lateral cleats, you should be able to cover groomed trails and packed snow, even moderate rolling terrain without much problem in these snowshoes. Do keep in mind, however, that as recreational snowshoes Tubbs Wilderness are not designed to tackle steeper inclines. 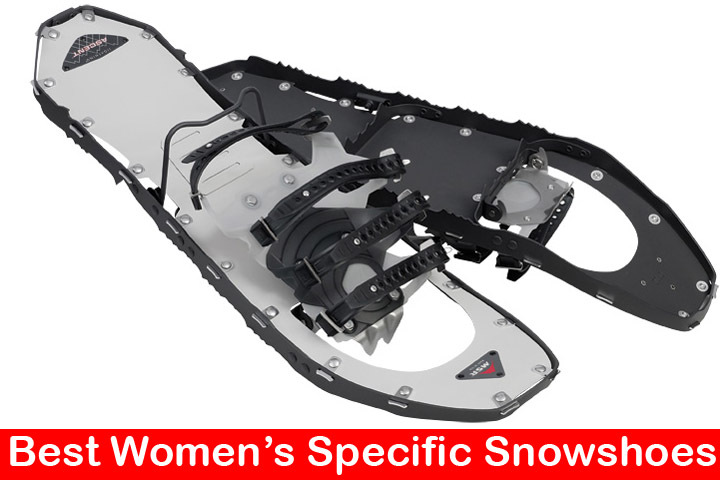 Elektra Series by Atlas have wide range of snowshoe options made specifically for women. The number behind them signifies the technical features that come with each model. Atlas Elektra 12 is the most advanced and most comfortable women’s snowshoes, but with all the convenience comes a pretty hefty price tag. If you’re reluctant, go for Elektra 10. They’re sold for a more affordable price yet packs similar specifications. There are only two size options: 23-inch and 27-inch; with maximum recommended weight for the latter is 200 pounds. No add-on flotation tails are available with them, which makes them less versatile than MSR Lightning Ascent. On the good side of things, they’re an ideal option if you want to travel lightly. Atlas Elektra 12 features pleasantly lightweight frames with tapered tails. They’re narrower compared to Atlas Access Series (the male version) making it easier to stride, especially for women with shorter gaits. However, it keeps the snowshoes from providing optimum flotation on powdery conditions. You’ll notice it as the terrain becomes steeper and deeper in snow. Another interesting thing about Atlas Elektra 12 is the fixed rotation bindings. They’ll help you move faster and easier but since the range of motion is limited, you’ll feel fatigue quicker in the long run. Also, as you deal with thicker snow, the tails may occasionally kick up snow. All in all, Atlas Elektra 12 are excellent option for recreational snowshoeing on groomed trails, but for backcountry travel there are better options out there. The type of the snowshoes is another important thing to consider upon selecting the ideal ones for you. Largely, snowshoes are grouped into three: backcountry, recreational, and running snowshoes. For beginners, it’s best to choose recreational snowshoes. Not only are they far less hefty in terms of price tag, but also many of them are now equipped with technical specifications that allow you to go and tackle moderate rolling terrain. That should be enough of a challenge for first time snowshoers. 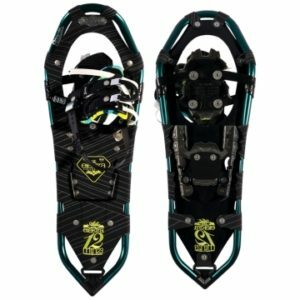 Once you get the excitement and ready for a step up, you can upgrade to the pricier backcountry snowshoes. They’re commonly bulkier in size and have aggressive sets of solid steel crampons. The larger size is necessary for the overall flotation on deep snow while the crampons help to provide traction on packed snow and icy slick slopes. For more information about types of snowshoes and their anatomy, please refer to our Snowshoes Buying Guide.